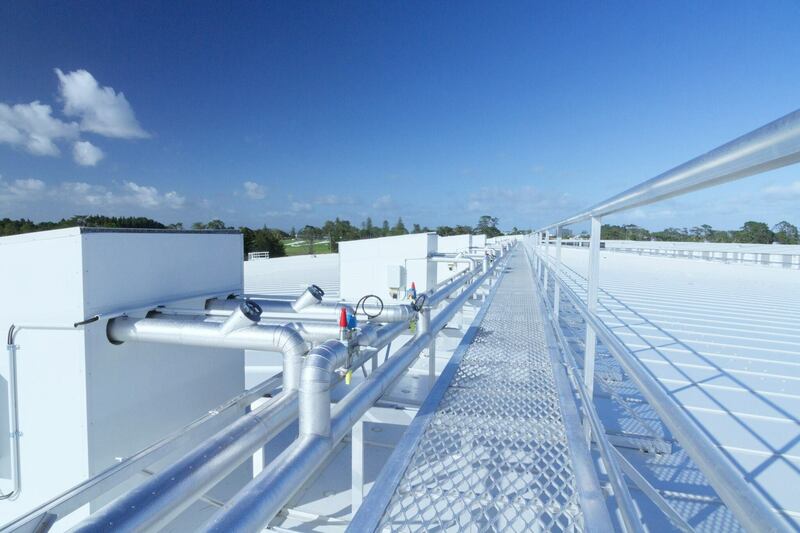 Developed for superior roof protection, our walkway systems are lightweight for minimal loads, strong for maximum spans and raised to avoid debris traps. 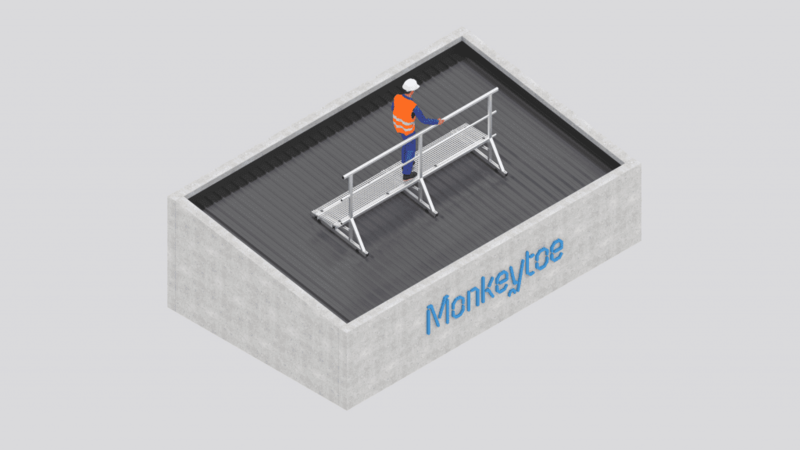 Made from premium aluminium or Fibre Reinforced Plastic (FRP), our lightweight, strong walkway structures transfer loads to the roofing structure, bearing no weight on the roofing itself. They clamp lightly onto the roofing profile and transfer loads through the same fixing points as the roofing itself to be fully compatible with your roofing warranty. The aluminium beams span up to 3m between supports while maintaining a massive live load of 2.5Kpa/m, or about three people per square metre. 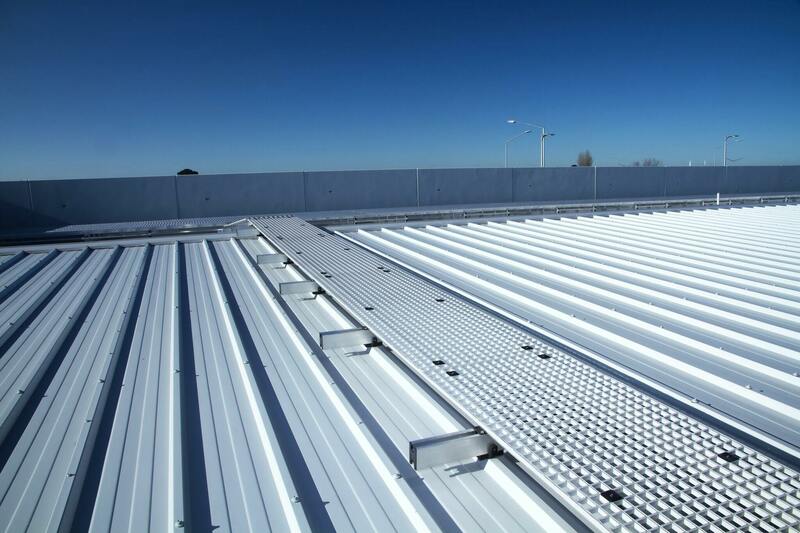 The long spans mean fewer contact points with the roofing for greater design and installation flexibility. 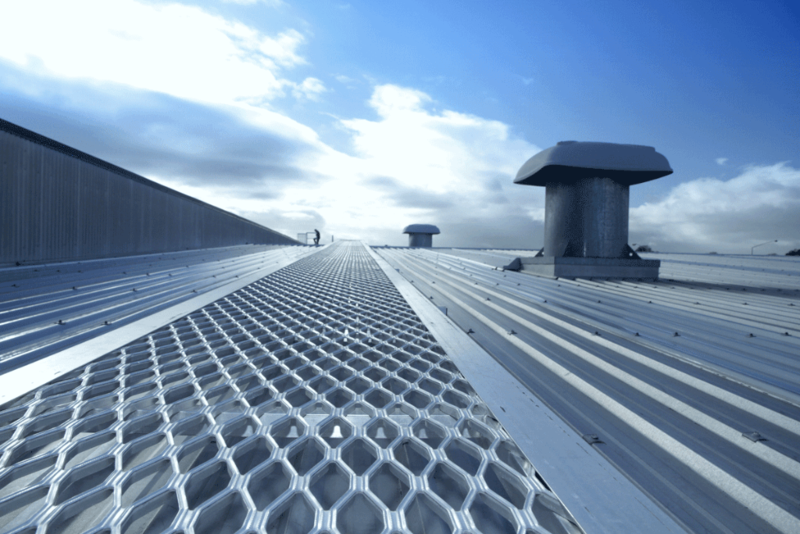 All materials are corrosion free, compatible with modern roofing systems and use open knurled mesh for non-slip access even in icy conditions. 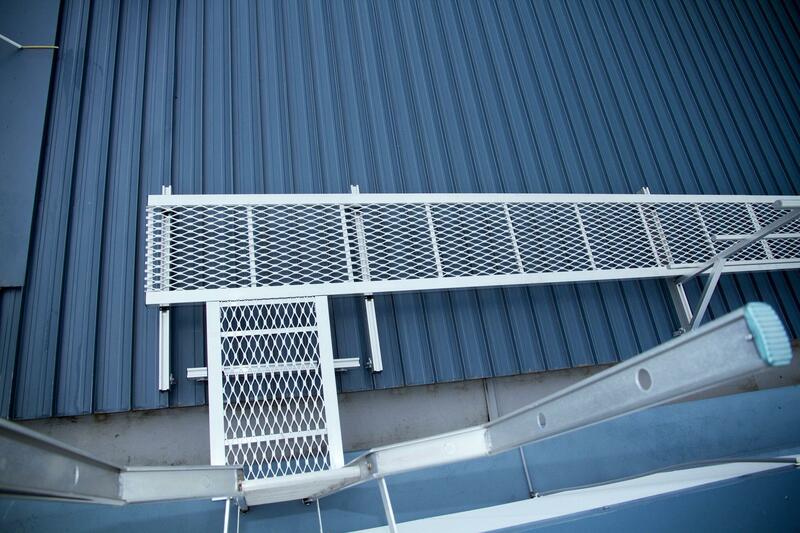 These walkways are teamed with our handrails and guardrails. 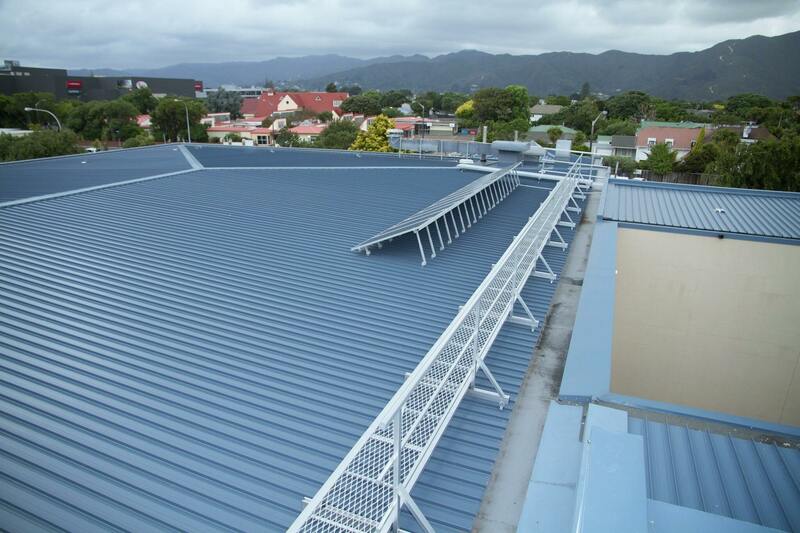 All support is back to the sub-structure – no loading on the roof profile. 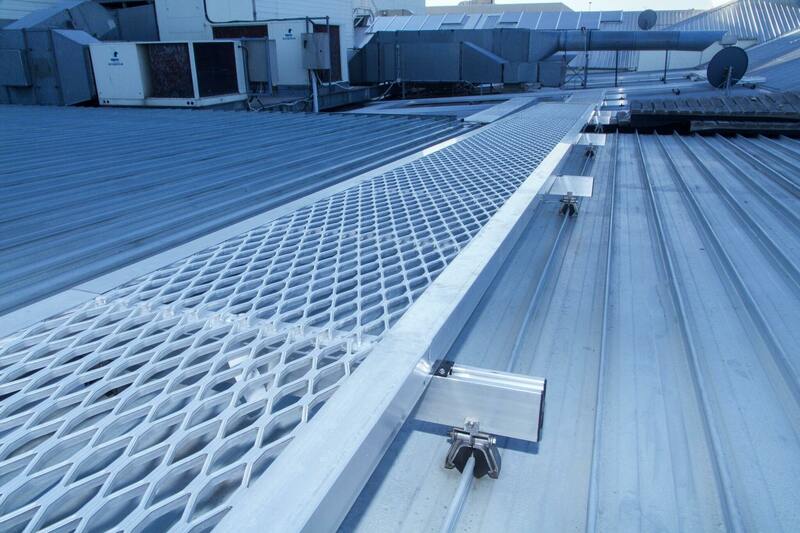 For longer roofing spans and more extreme conditions. 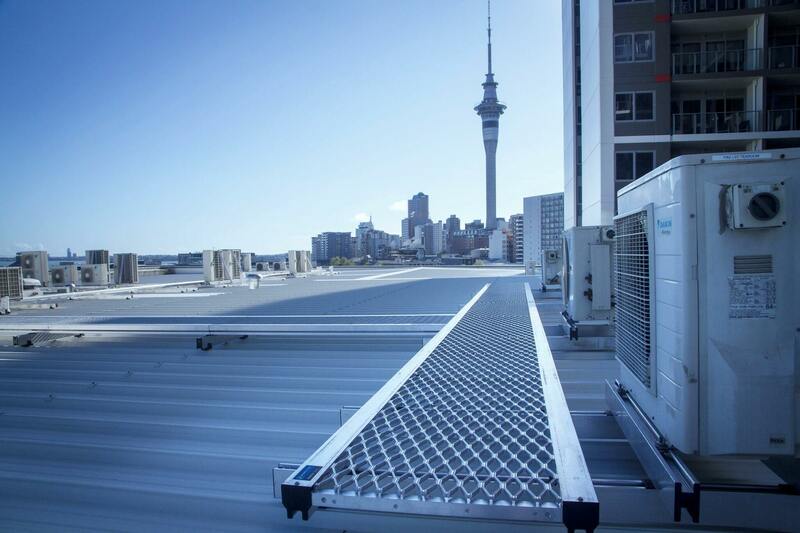 Manufactured using Fibre Reinforced Plastic (FRP), for a more lightweight option. Levelled (7-50deg) High tensile aluminium construction incorporating the amplimesh deck which is welded into the edge bearer extrusions to form a modular walkway for commercial & industrial applications between 7-50 degrees. 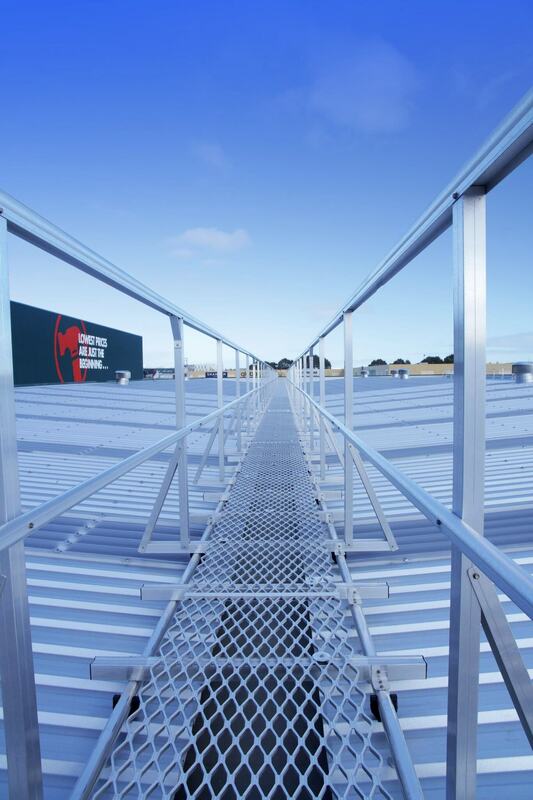 Levelled (7-50deg) – double handrails High tensile aluminium construction incorporating the amplimesh deck which is welded into the edge bearer extrusions to form a modular walkway for commercial & industrial applications between 7-50 degrees, with double handrails. 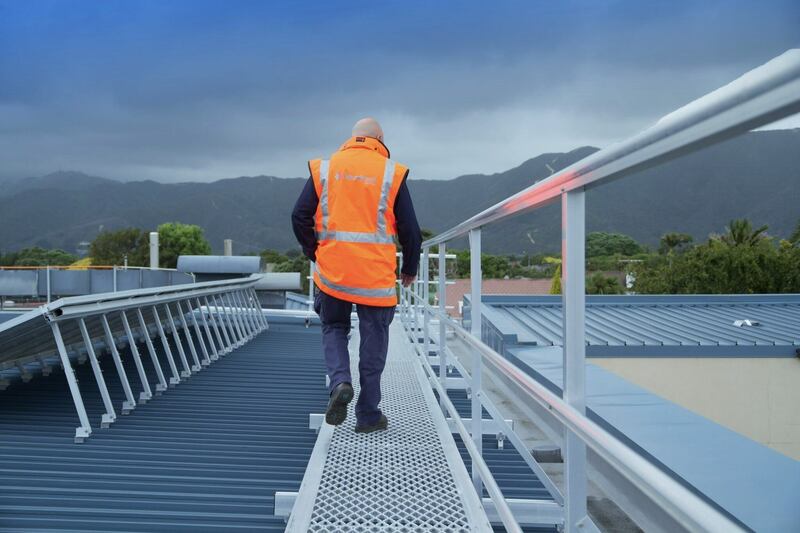 Levelled (7-50deg) – single handrail High tensile aluminium construction incorporating the amplimesh deck which is welded into the edge bearer extrusions to form a modular walkway for commercial & industrial applications between 7-50 degrees, with single handrail. 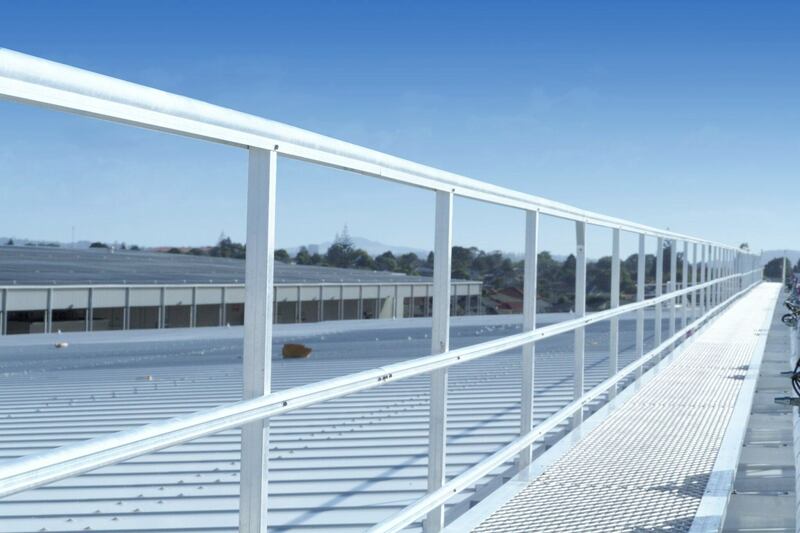 Non-levelled (0-6deg) – single handrail High tensile aluminium construction incorporating the amplimesh deck which is welded into the edge bearer extrusions to form a modular walkway for commercial & industrial applications between 0-6 degrees, with single handrail. 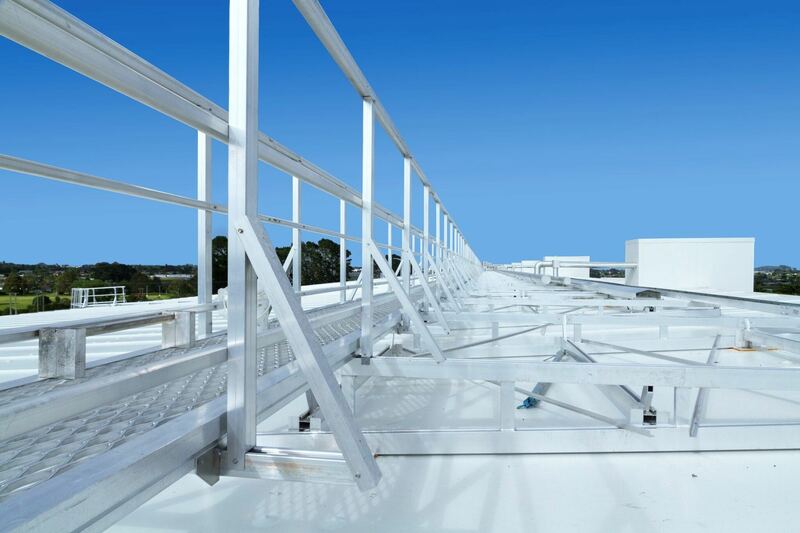 Non-levelled (0-6deg) – double handrails High tensile aluminium construction incorporating the amplimesh deck which is welded into the edge bearer extrusions to form a modular walkway for commercial & industrial applications between 0-6 degrees, with double handrails. 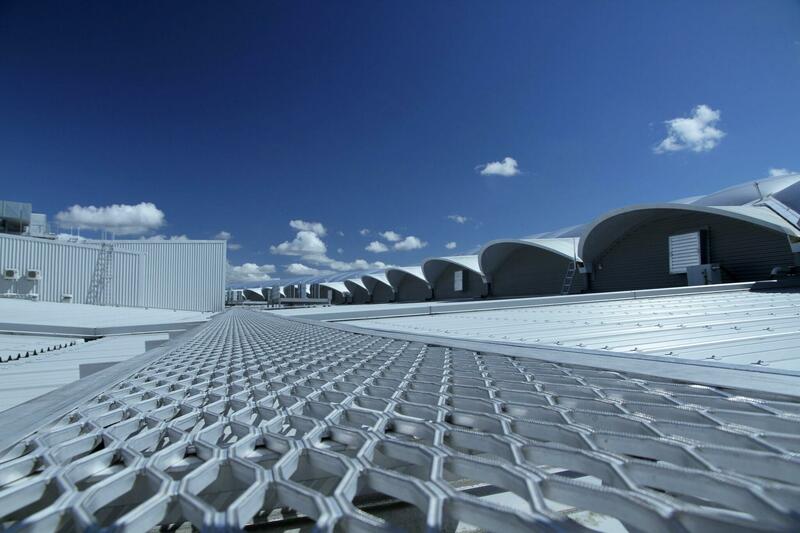 Non-levelled (0-6deg) High tensile aluminium construction incorporating the amplimesh deck which is welded into the edge bearer extrusions to form a modular walkway for commercial & industrial applications between 0-6 degrees. Levelled (7-50deg) Lightweight fiberglass mesh deck fixed to aluminium longitudinal support beams forming a modular walkway for commercial & industrial applications between 7-50 degrees. 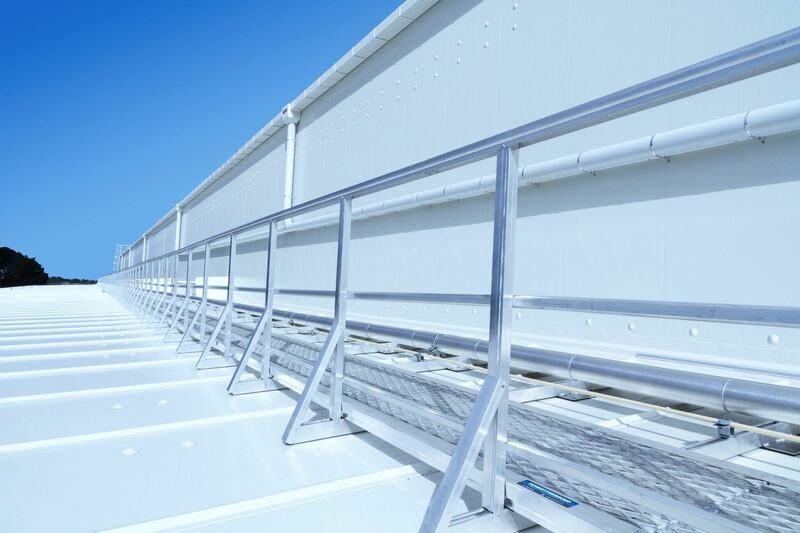 Levelled (7-50deg) – single handrail Lightweight fiberglass mesh deck fixed to aluminium longitudinal support beams forming a modular walkway for commercial & industrial applications between 7-50 degrees, with single handrail. 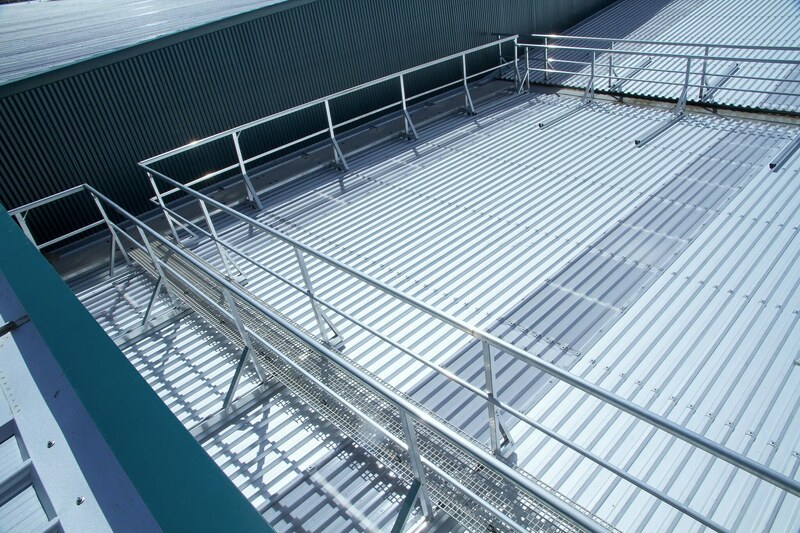 Levelled (7-50deg) – double handrails Lightweight fiberglass mesh deck fixed to aluminium longitudinal support beams forming a modular walkway for commercial & industrial applications between 7-50 degrees, with double handrails. Non-levelled (0-6deg) Lightweight fiberglass mesh deck fixed to aluminium longitudinal support beams forming a modular walkway for commercial & industrial applications between 0-6 degrees. 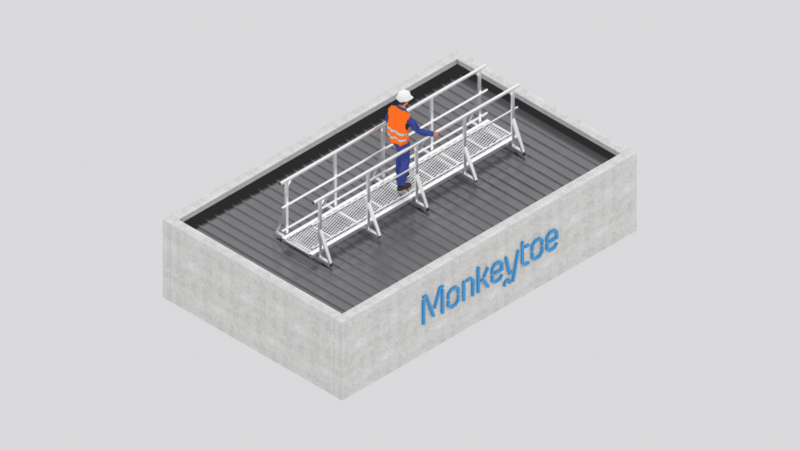 Non-levelled (0-6deg) – single handrail Lightweight fiberglass mesh deck fixed to aluminium longitudinal support beams forming a modular walkway for commercial & industrial applications between 0-6 degrees, with single handrail. 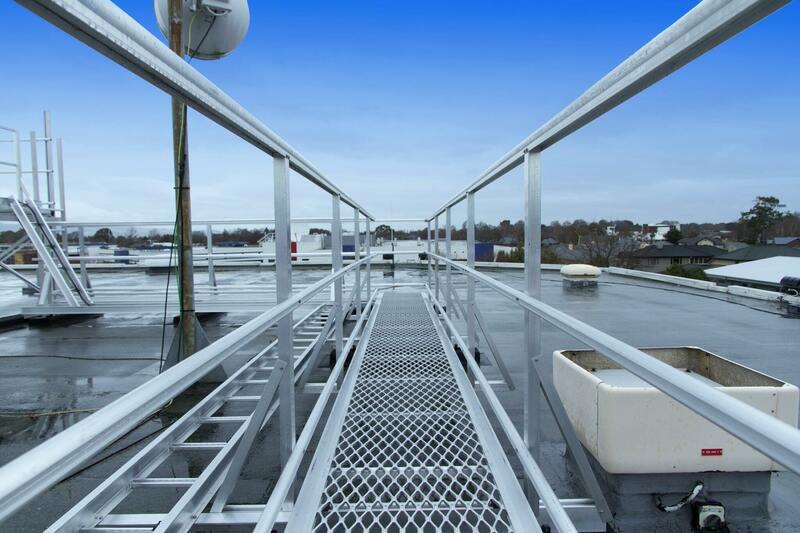 Non-levelled (0-6deg) – double handrails Lightweight fiberglass mesh deck fixed to aluminium longitudinal support beams forming a modular walkway for commercial & industrial applications between 0-6 degrees, with double handrails. 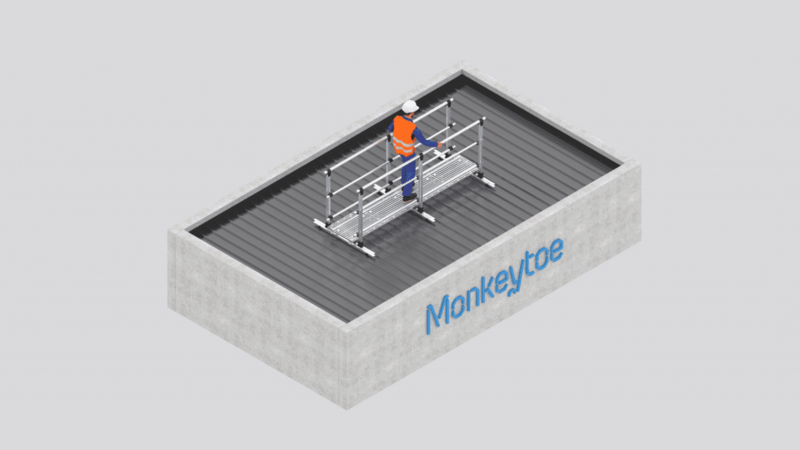 Non-levelled (0-6deg) High tensile aluminium I-beam frame with polyethylene mesh which is mounted onto the roof profile to form a modular walkway for commercial & industrial applications between 0-6 degrees. 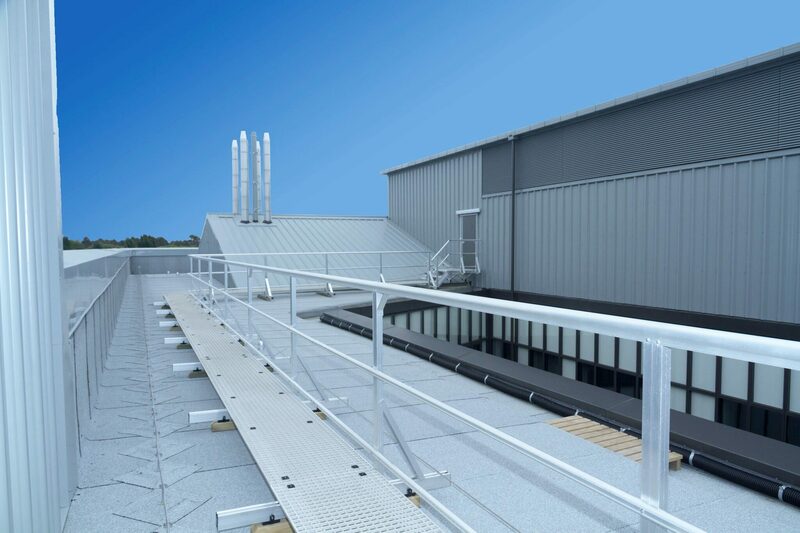 Non-levelled (0-6deg) – single handrail High tensile aluminium I-beam frame with polyethylene mesh which is mounted onto the roof profile to form a modular walkway for commercial & industrial applications between 0-6 degrees, with single handrail. 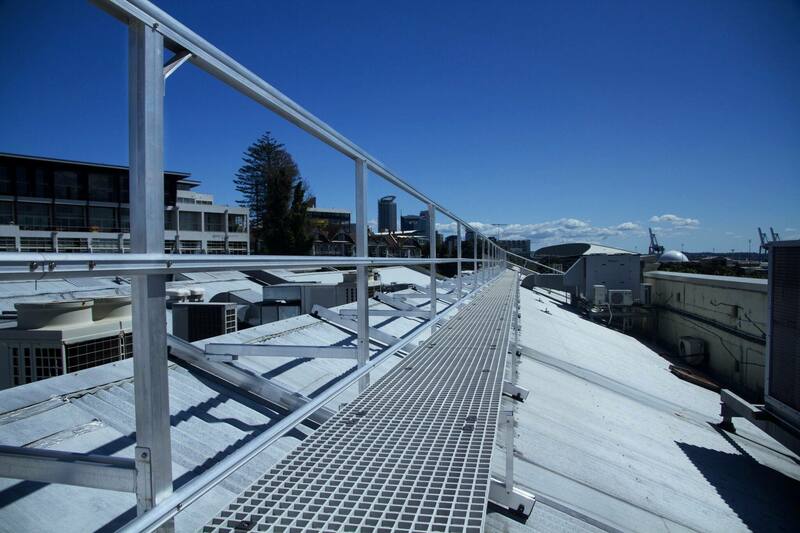 Non-levelled (0-6deg) – double handrails High tensile aluminium I-beam frame with polyethylene mesh which is mounted onto the roof profile to form a modular walkway for commercial & industrial applications between 0-6 degrees, with double handrails. 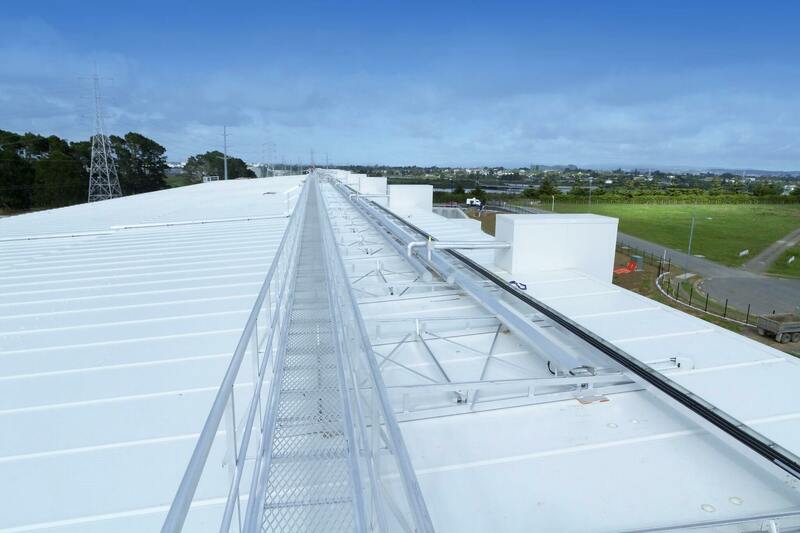 This system has been designed to the AS/NZS 1170, Parts 0, 1, 2, 3 & 5 Structural design actions and in accordance with the Building B1 structure code. 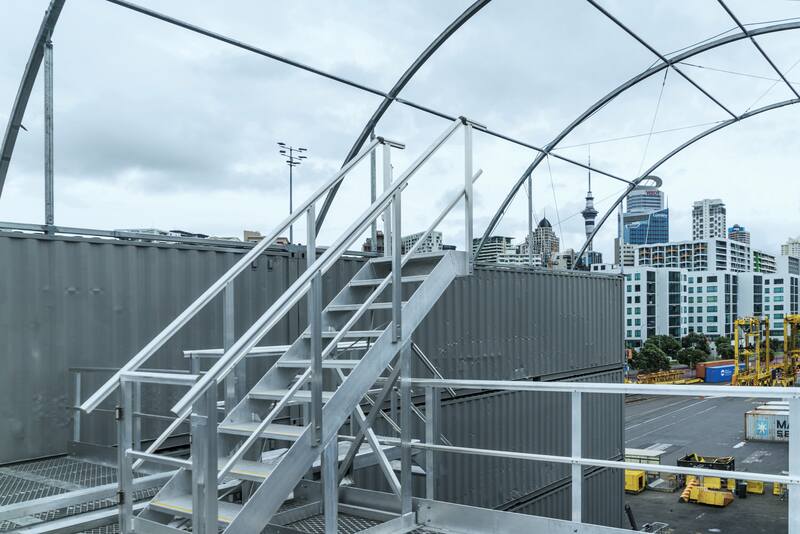 What’s the main difference between the Smartwalk Walkway and the Skywalk Walkway? The Monkeytoe Smartwalk walkway is a full aluminium fabricated system which results in a very strong walkway. Being fabricated with 2 specialised side beams means this walkway can span up to 3m with loading of 2.5kpa/m. 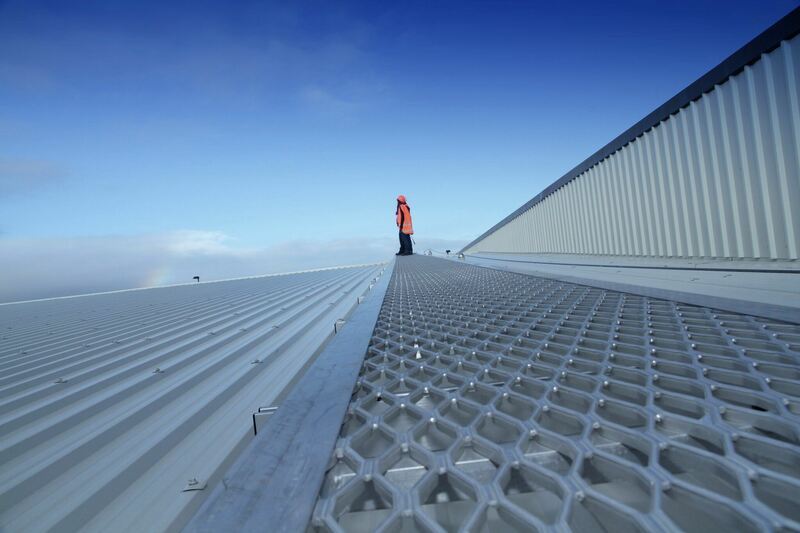 The Skywalk is a lighter walkway that spans a maximum of 2.4m between supports and then has the FRP Deck clipped to support beams underneath. The Skywalk is a lighter construction, but more modular. Why don’t timber walkways do the job? 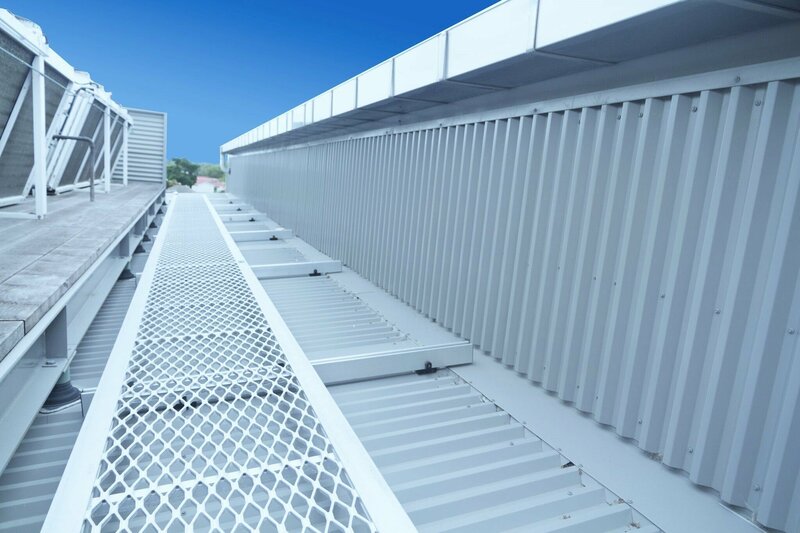 Timber walkways cause two issues; The tannin in the timber reacts with the colour steel and will often begin corroding within one year of installation. 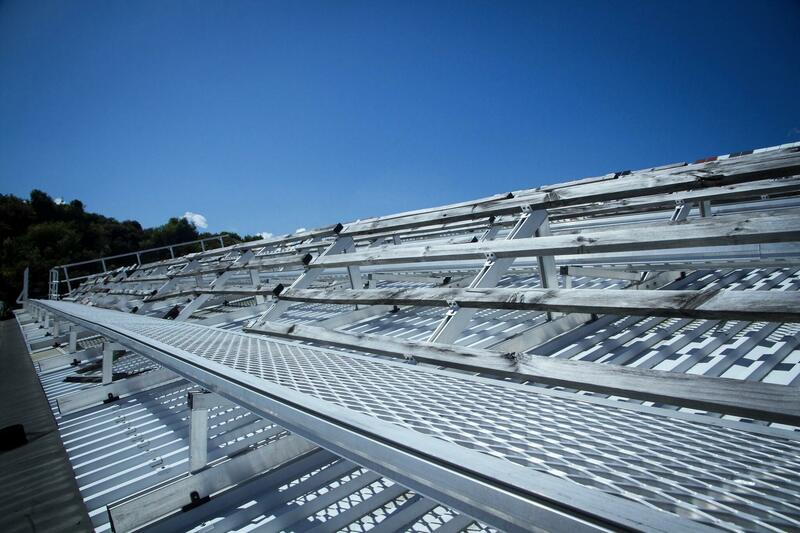 Even where malthoid has been installed between the timber and the roofing, the same reaction happens. 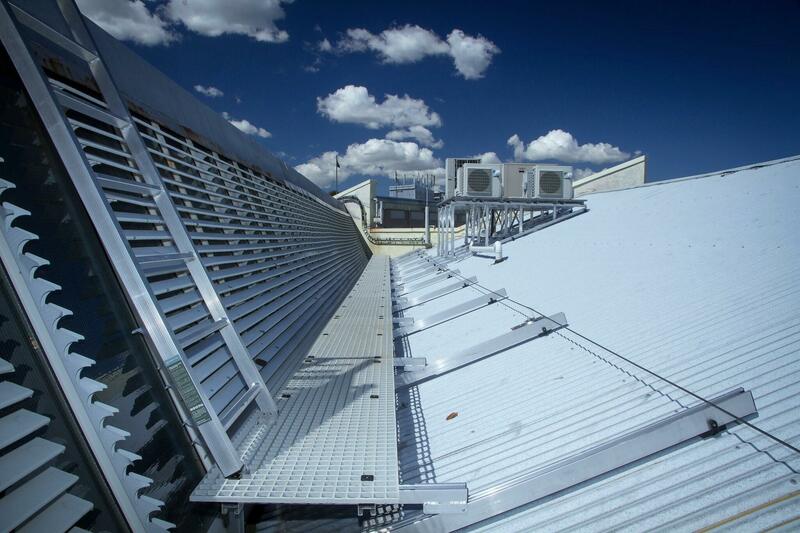 Timber retains moisture which keeps can keep the roof wet 100% of the time. 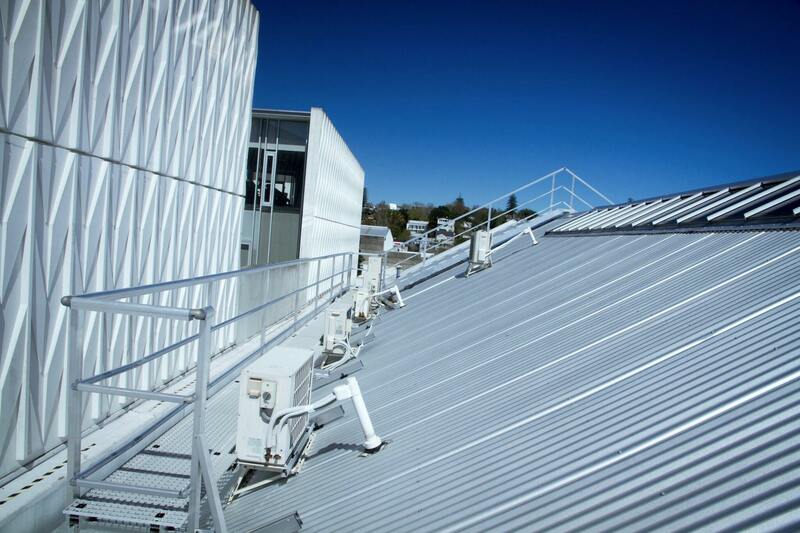 Colour steel must be given a chance to dry out and without that chance it begins to corrode. 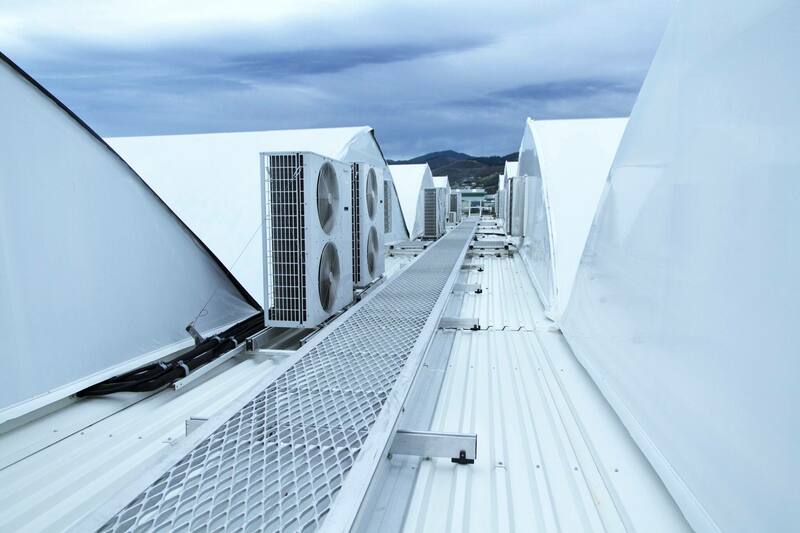 Although timber is sometimes more cost effective to install, it will cause many longer term maintenance issues and associated costs. 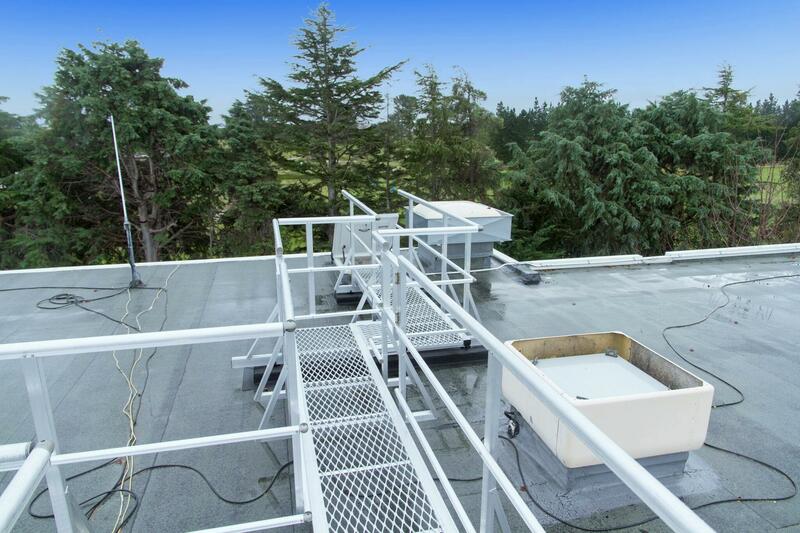 When does a walkway require handrails? 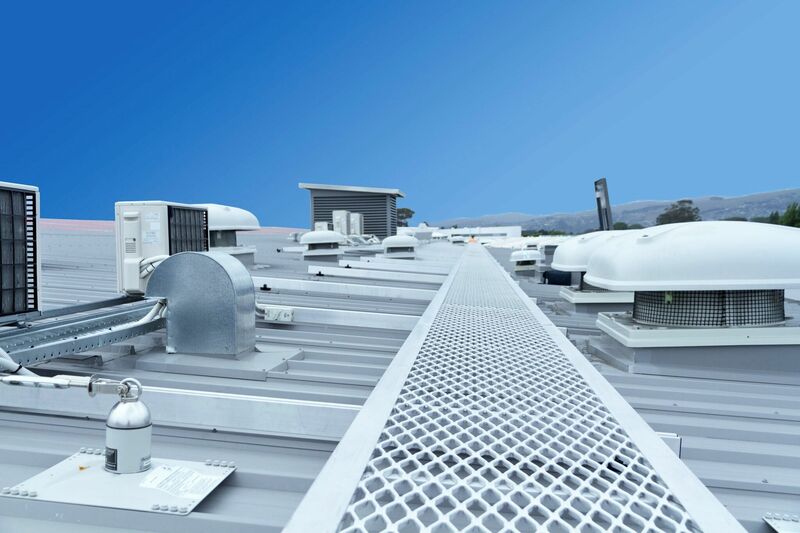 When the walkway is near a potential fall area of more than 300mm so generally when the roof has a pitch of more than 7°.